I believe I have only been on one dive boat live aboard previously, but have been on similar excursions for whale watching and sailing where we stay on a big boat and drag a dinghy behind us. I’ve never been on a live aboard when another flat decked dive boat the size of ours with tanks and a cover follows along. Though nothing fancy, it is nice to leave all our wet gear on the Dhoni. The group of twenty four divers were broken into four smaller sections. Ramona, Michael, Julie, Dustin, Rootie and I comprised the “American” group who was led by Akko. There were also Asian, International, and German/Asian groups led by Chris, Ian, and Russ, respectively. Our first dive was a short Dhoni ride away form the MV Orion at Kurumba House Reef in North Male Atoll. It was a simple wall dive that we used as our check out dive to get used to all of our equipment, new and old. The coral was nothing to write home about, but the sea life was lovely. We spotted a few morays, lionfish, Moorish idol, butterflies, angelfish, an octopus, and countless sea stars. I believe my favorite sighting was a white eyed eel. I haven’t seen an eel quite like it previously, so it was a pleasure. Upon return to our boat, we sat down for a breakfast of eggs made to order plus sausage, tortillas and tuna fish with coconut. I’ve never had tuna fish for breakfast. Our next dive site, Maaya Thila, was located in North Ari Atoll, a few hours west by boat from North Male. As such, we motored along admiring the breathtaking water while switching from lounge chairs between the sun and the shade. Ramona did the dolphin dance from her suite’s personal deck, and the dolphins responded as they rocketed around the bow of the boat. Eventually, we congregated into the salon for lunch and our next dive briefing. Upon boarding the dive vessel we found out if we were diving air or Nitrox by testing the mix in our tank (everyone dove air on the first dive). I’ve never experienced this type of procedure. The previous night when one of the dive masters was checking my cards, he asked me if I was certified to dive Nitrox. I informed him that I completed the Nitrox specialty as part of my advanced SSI certification, but I never have bothered diving with the mix as I wasn’t sure how to make the appropriate adjustments to my computer. He responded, “The rest of your group is diving Nitrox. We can probably figure out your computer. Don’t you want the extra bottom time?” “I suppose I could,” I answered, but nothing was confirmed as I knew Rootie was certified Nitrox as well, but didn’t normally dive the mix either. So, before we attached our regulators to our tanks, under the instruction of our friend Dustin, Rootie and I held the Nitrox analyzer to the tanks and adjusted our computers appropriately. Rootie was surprised to know she and I were both diving Nitrox. I suspected it. Maaya Thila is a pinnacle with a strong current that attracts sharks, trevally, and unicornfish. 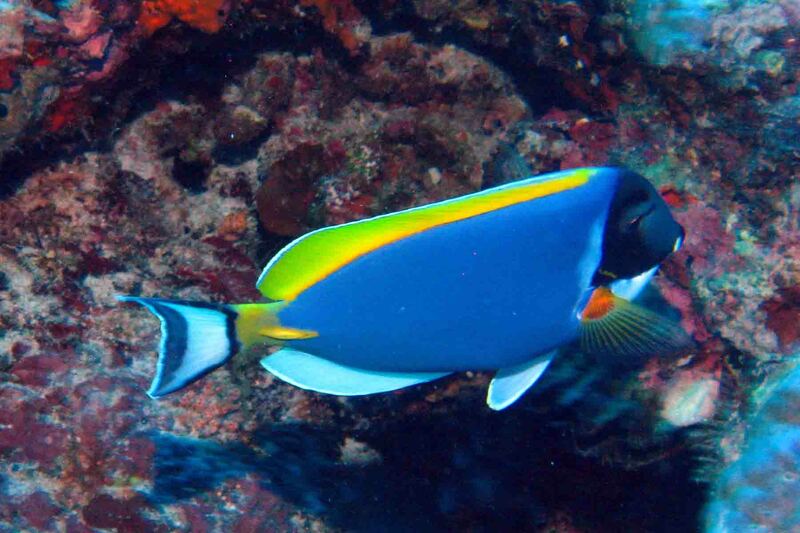 It is also home to nice coral with colorful fish. As always, it is a treat to see the clownfish protect their anemone homes. We never get to see this in the Caribbean. We also got to see another octopus in daylight, not a common feat. The current was quite strong in the beginning which also affected the visibility that wasn’t nearly as nice as our first dive. Schools of triggerfish swarmed, as a white tip and a black tip reef shark lurked at the bottom and a turtle came up for air. A few big grouper and sweetlips took cover beneath the coral overhangs as parrotfish chomped on the coral. Unfortunately the dive site seemed rather disturbed with all the groups diving this one small area. We were not the only boat enjoying the popular site. Neither Rootie nor I appreciated weaving through the other divers to keep up with our leader. The night dive planned for us to visit the same location with the same number of boats. While many people love night dives, I have never found them terribly exciting as I really like being able to see the color in the daylight. As such, based on the day conditions, I opted out. Rootie did too, as well as one other passenger. We heard it was a good dive with several more sharks. For some reason, I’m more intrigued with the little stuff that cling to the reef, so I didn’t feel like I missed too much.